I’ll go into a little more detail about these problems. Original front camera flexes for the iphone 7 and 7+ are hard to come by. Unfortunately, there are have been cheaper aftermarket flexes that, when used, result in loss of audio or slow boot problems. The best thing to do is to always try a known good (original) front camera flex along with a new screen to rule out the front camera flex as being the problem to the slow boot. Sometimes a torn original front camera flex causes the slow boot as well. So, as a screen repair shop, you should have a fully assembled known good working screen along with all of the small parts (except for the home button, which will need to be transferred) already on it. The wifi flex is located at the top of the logic board and housing. What we’ve seen happen is that when the front camera flex holding plate is unscrewed from the logic board, the screwdriver slips and either cracks the wifi chip or damages the flex. When this happens, the wifi flex can be reconnected to the logic board, but the phone will be slow to boot and after bootup, the screen sometimes freezes. The fix is to visually inspect the wifi flex and replace, if necessary. Another common problem is a ripped home button flex or cracked U10 chip on the home button flex. The U10 chip handles the home button press along with the heptatic feedback. Before the iPhone 7 and iPhone 7+, we, as cell phone repair techs, were always taught to lift the screen with the iSesamo from the bottom left of the housing. Well, with the iPhone 7/7+, the home button flex and U10 chip are located right at the bottom left of the screen. When the iSesamo goes in to lift the screen, what often happens is that the metal pry tool rips the flex and/or digs too deep and cracks the U10 chip. Sometimes the slightly torn flex is barely noticeable, but you’ll know if there is a problem when the home button and/or finger print doesn’t work after the screen repair. Also, if the original home button is not connected to the logic board, then the phone will also be slow to boot. To fix all of these problems, we can replaced the U10 “Turtle” chip through microsoldering and run traces for the torn home button flex. If the flex is completely ripped, then there is no way to fix all of the torn traces. To prevent this problem, just lift the screen from the bottom right side of the screen or use a plastic pry tool. We coined the term “audio ic disease” as a play off of the dreaded “touch ic disease” affecting the iphone 6/6+. Similar to touch ic disease, audio ic disease is when one of the traces under the audio ic disconnects from the logic board, either through corrosion or bending. 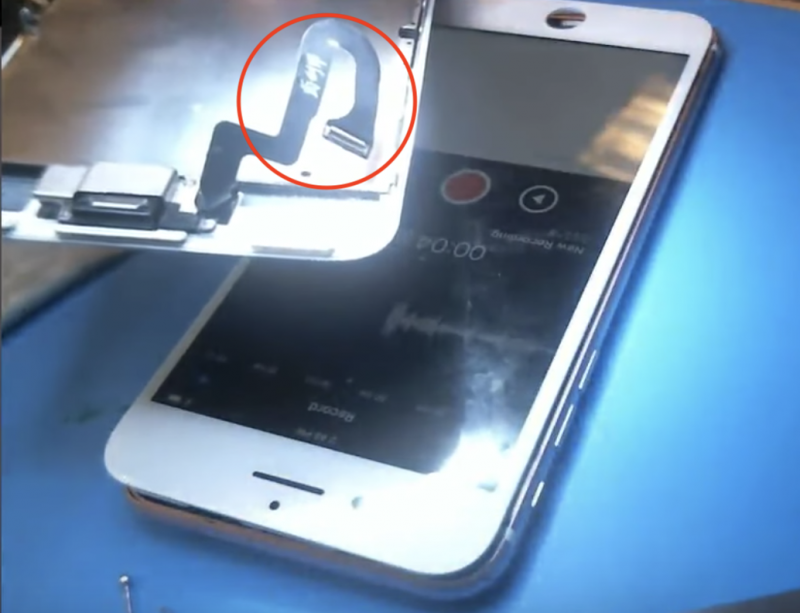 There is really no way to determine whether the C12 pad has actually disconnected from the logic board, so the best way to determine whether this is the problem is to open up the voice memos app and see if the red record button is grayed out or not. Just make sure that you rule out the front camera flex first. If the front camera flex is ruled out, then the most likely problem is audio ic disease. The fix is to replace or reball the audio ic chip and run a micro-jumper to the c12 pad. We’ve been seeing a lot more of these lately. Most notably in the A1660 model of the iPhone 7, which is the CDMA version. This problem doesn’t usually cause the slow boot or freezing, but more often a “searching/no service” cell signal issue and/or an error 4013 upon update or restore. Usually the phone is unusable after a failed restore. As a matter of fact, Apple has just issued a free replacement if this happens to your phone. We’ve determined that one of the problems is a short in the baseband chip itself. We’ve also seen a short around the baseband PMU IC, which handles the power to the baseband chip. Sometimes this problem is repairable, sometimes it’s not. There’s really no way to tell aside from opening the phone and using a multimeter to locate the problem.